Back once again in 2016 on vinyl as a double LP featuring the bonus track ''P is Free.'' Lower price than the last re-issue. 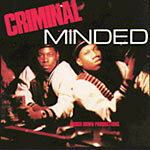 Traffic Entertainment Group and B-Boy Records present one of the most influential and original hip hop albums in music history by none other than BDP for 1987's Criminal Minded. The combination of the legendary KRS-One, the late DJ Scott La Rock (who was murdered just months after the album's release) and D-nice, brought forth a hard hitting street-wise album backed by an intelligent, politically and socially conscious approach to the lyrics over the minimal and simplistic beats of the time. Elevating the standards and proving that rap could be a dynamic and consciousness-raising medium, as the album touched on life in the South Bronx, paving the way for what some would call the official arrival of gangsta rap.